The integration with famous Stripe payment processor allows charging your users for Ad postings using credit cards without ever leaving your website. Creating a new credit card while making a payment. 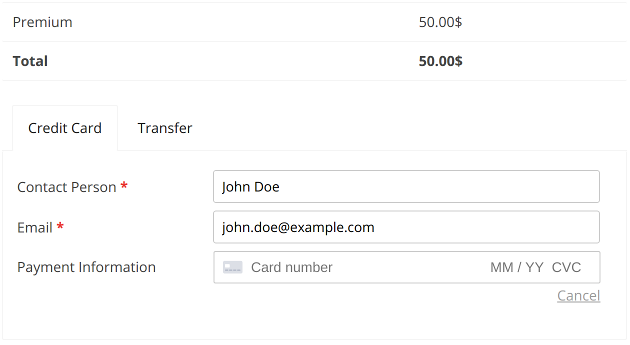 In order to install the Stripe integration, you need to first purchase it from our WPAdverts Stripe Integration page. Once you have it purchased and downloaded, you can install and activate the wpadverts-stripe.zip file from wp-admin / Plugins / Add New / Upload panel. In the first two fields (Publishable Key and Secret Key) you need to enter the keys generated for you by Stripe. If you do not have Stripe account yet then you will need to create it first. You can signup for a Stripe account here. The API keys will be visible in your account dashboard. Copy them to the WPAdverts Stripe configuration from there. More details about the API keys you can find in the documentation. Payment Method Name: This is the payment method name that will be visible to users in the checkout (in third [adverts_add] step). More specifically this is a tab name in the checkout. Payment Description: Additional information that will appear on your customers’ credit card statements. Make sure to enter here information that will allow the user to remember what he paid for to avoid getting a chargeback. Receipts: If you will check this checkbox then Stripe will automatically email receipts to customers for all the purchases. Before you will receive first payment, you need to make sure that you have the Payments Module enabled and that you have at least one Pricing with a price greater than 0 created. Once you do that, go to a page with [adverts_add] shortcode and post an Ad. In the third step use card number 4242 4242 4242 4242 with a random data and CVC code. This is a test card which you can use to make test payments. If you are making a payment as a logged in user then the credit card data will be saved for future use. Later you will be able to pay with this card just by selecting it from cards list, you will not need to enter the card details again. If you are wondering what about the data security? Then there is no need to. WPAdverts Stripe integration stores in your database only the customer Stripe ID. All the credit cards data is pulled every time from the PCI Compliant Stripe server. This is a quick and secure way to make credit card payments. Even if your own website security will be compromised no credit card data will be leaked. Note that from the page with credit card selection users can also delete card (the trash icon on the image above) and select a default credit card (if the user has more then one card created).